Objective To compare clinical and radiological outcomes of four dynamic treatment strategies in recent-onset rheumatoid arthritis (RA) after 5 years follow-up. Methods 508 patients with recent-onset RA were randomly assigned into four treatment strategies: sequential monotherapy; step-up combination therapy; initial combination with prednisone; initial combination with infliximab. Treatment adjustments were made based on 3-monthly disease activity score (DAS) measurements (if DAS >2.4 next treatment step; if DAS ≤2.4 during ≥6 months taper to maintenance dose; if DAS <1.6 during ≥6 months stop antirheumatic treatment). Primary and secondary outcomes were functional ability, joint damage progression, health-related quality of life and (drug-free) remission percentages. Results After 5 years, 48% of patients were in clinical remission (DAS <1.6) and 14% in drug-free remission, irrespective of initial treatment. After an earlier improvement in functional ability and quality of life with initial combination therapy, from 1 year onwards clinical outcomes were comparable across the groups and stable during 5 years. The initial combination groups showed less joint damage in year 1. In years 2–5 annual progression was comparable across the groups. After 5 years, initial combination therapy resulted in significantly less joint damage progression, reflecting the earlier clinical response. Conclusion Irrespective of initial treatment, an impressive improvement in clinical and radiological outcomes of RA patients can be achieved with dynamic treatment aimed at reducing disease activity, leading to 48% remission, 14% drug-free remission and sustained functional improvement. Starting with combination therapy resulted in earlier clinical improvement and less joint damage without more toxicity. Great improvements in the treatment of rheumatoid arthritis (RA) have been made in the past few decades. The evidence for the benefit of the early use of (combinations of) disease-modifying antirheumatic drugs (DMARD) and biological agents,1,–,6 together with the introduction of dynamic tightly controlled treatment aimed at a predefined goal,7,–,9 has led to a shift in traditional treatment paradigms. It is not known what clinical and radiological outcomes can be expected in the longer term in RA patients treated according to an early, intensive treatment approach. The BeSt (Behandel-Strategieën, Dutch for treatment strategies) study incorporated these new insights into early, goal-directed treatment by comparing four dynamic treatment strategies rather than individual therapies, using antirheumatic drugs and combinations of drugs in various orders.10 11 Designed in the late 1990s, it was ambitious in aiming at low disease activity,12 13 and introducing protocolised tapering and discontinuation of all antirheumatic drugs when clinical remission is achieved. Furthermore, it provides a unique patient cohort because it is, as far as we know, the only RA trial in which patients are still monitored every 3 months after 5 years of follow-up and protocolised treatment adjustments continue to be made aiming at low disease activity. Here we present the clinical and radiological outcomes of the BeSt study after 5 years of follow-up. The main objectives were: (1) to assess functional status, quality of life and the amount of joint damage after 5 years of intensive, disease activity score (DAS)-directed treatment; (2) to assess whether initial improvements in functional ability and quality of life can be sustained; (3) to compare clinical outcomes and annual joint damage progression scores between the four treatment strategies; (4) to assess the percentage of patients in remission and drug-free remission and assess joint damage progression in these patients. The BeSt study design has previously been published in detail.10 It is a randomised single-blind clinical trial to evaluate the efficacy and safety of four treatment strategies in recent-onset RA patients. Based on 3-monthly disease activity measurements, treatment adjustments were made aimed at achieving and maintaining a DAS (44 joints) of 2.4 or less.12 It is designed and conducted by the Foundation for Applied Rheumatology Research, a collaboration between rheumatologists in the western part of The Netherlands. Between March 2000 and August 2002, 508 patients from 20 hospitals in The Netherlands with DMARD-naive RA according to the 1987 American College of Rheumatology criteria,14 ages 18 years or older, disease duration of 2 years or less, with active disease with six or more of 66 swollen joints and six or more of 68 tender joints, and either an erythrocyte sedimentation rate of 28 mm/h or greater or a global health score of 20 mm or greater on a 100-mm visual analogue scale (0, best; 100, worst) gave informed consent. Patients were randomly assigned into four treatment strategies. 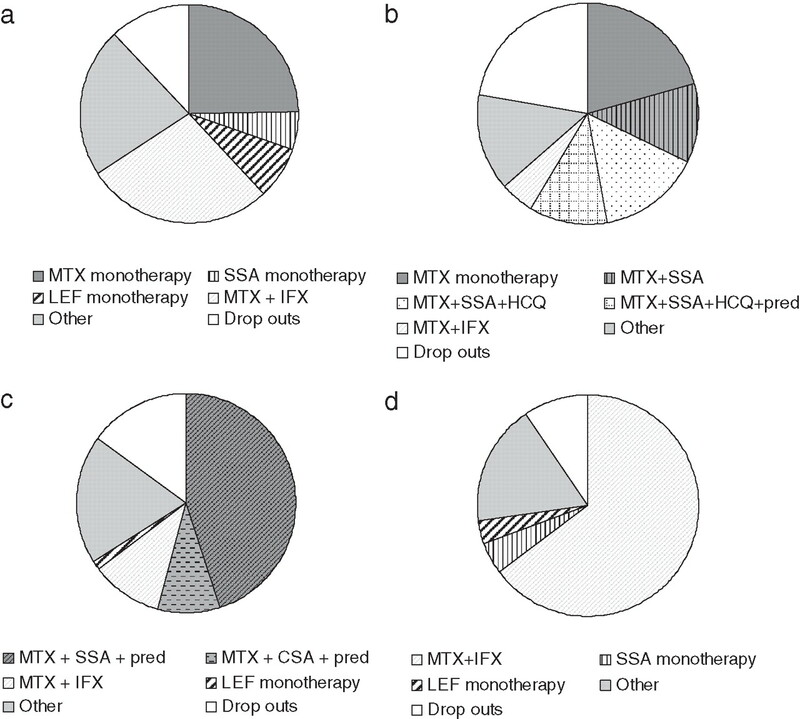 Group 1 (sequential monotherapy, n=126) and group 2 (step-up combination therapy, n=121) started both with methotrexate monotherapy, whereas group 3 (initial combination therapy with prednisone, n=133) and group 4 (initial combination therapy with methotrexate and the tumour necrosis factor alpha inhibitor infliximab, n=128) started with combination therapy. In all groups, treatment adjustments were made based on 3-monthly disease activity measures, aiming at a DAS of 2.4 or less (low disease activity). The DAS was calculated by a trained nurse, who remained blinded to the treatment. 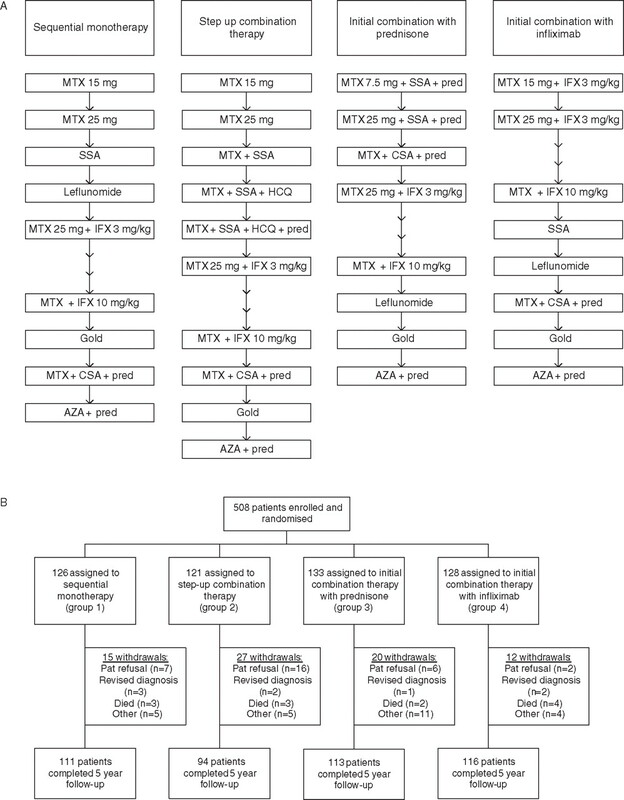 If the DAS was greater than 2.4, the next treatment step was taken according to the fixed stepwise treatment protocol for each group (figure 1A). If the DAS was 2.4 or less (low disease activity) for 6 months or longer, medication was tapered to a maintenance dose. Details of the drug doses in the different treatment steps were reported previously.10 Routine laboratory measurements were performed 3-monthly. For all strategy arms the protocol allowed discontinuation or reduction to the lowest tolerated dose of drugs that, in the opinion of the treating physician, caused side-effects. Flow diagram for treatment (A) and patients (B). AZA, azathioprine; CSA, ciclosporin A; HCQ, hydroxychloroquine; IFX, infliximab; MTX, methotrexate; pred, prednisone; SSA, sulphasalazine. From the third year of treatment, patients who had tapered to low-dose monotherapy and had a DAS less than 1.615 for at least 6 months tapered and discontinued the last DMARD. If the DAS increased above 1.6, the last DMARD was immediately restarted, and could not be discontinued again. Primary outcomes were functional ability measured every 3 months with the Dutch version of the health assessment questionnaire16 (HAQ; 0, best; 3, worst) and joint damage progression on radiographs of hands and feet measured with the Sharp-van der Heijde method (SHS; range 0–448 points).17 Annual radiographs of hands and feet at baseline and years 1, 2, 3, 4 and 5 were scored in one session per patient by two independent readers, blinded to treatment allocation, patient identity and in random time sequence. The mean scores of the two readers were used in the analysis. Health-related quality of life was measured with the medical outcomes study short form 36,18 3-monthly in the first 2 years of treatment and annually from year 2 onwards. Based on a reference population,19 two norm-based summary scales were derived: the physical component scale (PCS) and mental component scale (MCS). By definition, the mean PCS and MCS of the reference population are 50 (SD 10). Higher scores represent better health. Remission and drug-free remission percentages were calculated, using DAS less than 1.6 as the remission criterion.15 We calculated the SHS progression in patients in sustained drug-free remission (remission ≥1 year) in their first full year drug free. All adverse events (self-reported, or evident from laboratory tests or yearly general physical examination) were recorded. Serious adverse events were defined as conditions that are life threatening or leading to death, malignancies, conditions leading to (prolongation of) hospitalisation or conditions leading to significant or permanent disability. The software program SPSS version 16.0 was used, using the intention-to-treat principle for all results, except for the analysis of the proportions of patients in remission and drug-free remission in which completer's data were used. Characteristics at t=5 years were compared between the groups using analysis of variance, χ2 and Kruskal–Wallis when appropriate. Baseline PCS and MCS scores were compared with the reference population with a two-sample t test. The outcomes HAQ, SHS and quality of life (PCS, MCS) were longitudinally analysed using linear mixed models (LMM). For each outcome the covariance structure with the lowest Akaike value was used. To test whether there were differences in HAQ between the groups during 5 years of follow-up, a LMM with the outcome HAQ (21×HAQ per patient) was performed, with treatment group, time and their interaction as determinants (covariance matrix ARMA1.1). In the second LMM log-transformed SHS scores (to approach normality) of all years were compared to investigate whether there were differences in joint damage progression between the treatment groups over time, with time, randomisation and the interaction time*randomisation as determinants, corrected for log SHS of baseline, baseline C-reactive protein, age, gender, anticyclic citrullinated peptide, rheumatoid factor and baseline body mass index (covariance matrix unstructured). Finally, LMM was used to assess whether there were differences in quality of life between the patients in the four treatment groups during 5 years of follow-up, with PCS and MCS as outcomes and randomisation and time as covariates (covariance matrix unstructured). This was done by calculating and comparing areas under the curve (AUC) between the treatment strategies under the custom hypothesis subcommand of the LMM (TEST in SPSS). In all analyses comparing treatment groups, each treatment group was assessed independently and compared with the other groups one by one, without combining the results of treatment groups. Baseline characteristics between the four treatment groups were comparable (table 1). Patients had high disease activity (mean DAS 4.4) at baseline with compromised functional ability (HAQ 1.4). Erosions on radiographs of hands and/or feet were present in 72% of patients. During 5 years of follow-up, 72 patients (15%) withdrew from the study (figure 1B), 15 (12%), 27 (22%), 20 (15%) and 12 (9%) in groups 1–4 (group 2 vs group 4 p=0.05, other comparisons ns). The percentage of patients who had achieved the goal of DAS of 2.4 or less was similar in all groups (p=0.94, total 82%). The proportions of patients in each treatment step at t=5 years are depicted in figure 2. The initial monotherapy groups needed more treatment adjustments before achieving a DAS of 2.4 or less than the initial combination therapies. After 5 years 25%, 21%, 45% and 65% of patients in groups 1–4 were still on the initial treatment. Fifty per cent of patients in group 4 had permanently discontinued the initial treatment with infliximab because of a continuous good response, and 46% of patients in group 3 had successfully tapered and stopped prednisone. In groups 1–3, 41%, 12% and 21% had started delayed infliximab because of insufficient response to previous drugs, and 21%, 5% and 11% were still treated with infliximab at t=5 years, compared with 19% in group 4. In group 2, 26% had started prednisone because of insufficient response to step-up therapy with conventional DMARD, and 6% were still treated with prednisone at t=5 years, compared with 14% in group 3 (median dose 5 mg in both groups). For details on annual prednisone and infliximab use see supplementary table, available online only. Pies representing the proportion of patients in each treatment step after 5 years follow-up. (A) Sequential monotherapy, (B) step-up combination therapy, (C) initial combination with prednisone, (D) initial combination with infliximab. CSA, ciclosporin A; HCQ, hydroxychloroquine; IFX, infliximab; LEF, leflunomide; MTX, methotrexate; pred, prednisone; SSA, sulphasalazine. Patients in the initial combination therapy groups experienced an earlier improvement in functional ability than the initial monotherapy groups (figure 3A). At the end of the first year, the functional capacity had improved substantially to a comparable level in all four groups, and this improvement was sustained until 5 years of follow-up. At t=5 years there were no significant differences in functional capacity between the groups (mean HAQ 0.58). No major differences between limitations on the eight subscales of the HAQ were observed (data not shown). When taking into account all HAQ scores during 5 years of follow-up, patients in group 4 had better HAQ scores over time than patients in groups 1, 2 and 3 independently, and patients in group 3 had better HAQ scores than patients in groups 1 and 2 independently (LMM, p<0.001 for group 3 and 4 vs groups 1 and 2, p=0.01 for group 3 vs group 4). The mean HAQ score during follow-up was 0.70, 0.70, 0.62 and 0.54 in groups 1–4, respectively. Changes in HAQ, remission percentages, Physical and Mental Component Scale of the Short Form 36 and Sharp-van der Heijde score during 5 years of follow-up. HAQ, health assessment questionnaire; MCS, mental component scale; PCS, physical component scale; SHS, Sharp-van der Heijde score. Quality of life (PCS and MCS) was lower at the beginning of the study compared with the reference population (33 vs normal 50 for PCS (p<0.001) and 47 vs 50 normal for MCS (p<0.001) figure 3C,D). The PCS improved earlier in groups 3 and 4 than in groups 1 and 2. After 1 year the mean PCS was increased to a comparable level in all four groups (mean 45, SD 10) and sustained until 5 years of follow-up, without significant differences between the groups (mean PCS (AUC per month) 43.5, 43.3, 44.1, 45.0 for groups 1–4; PCS p=0.09 for 1 vs 4, p=0.08 for 2 vs 4, p>0.36 for other comparisons). The mean MCS improved to 52 (SD 9), which is slightly better than the healthy reference population. After 5 years of follow-up, we observed no differences in mean MCS between the treatment groups (mean MCS (AUC per month) 51.8, 51.0, 50.9, 51.2 for groups 1–4). In total, 2595 sets of radiographs were available, 479 (94%) from baseline and 446 (88%), 436 (86%), 432 (85%), 421 (83%), 381 (75%) from years 1–5. The interobserver intraclass correlation coefficient of the two readers for 5–0 change scores was 0.98. After 5 years, there was significantly more radiological progression in groups 1 and 2 than in groups 3 and 4, with median (mean) SHS progression of 3.5 (14.0), 2.5 (11.0), 1.0 (7.6) and 1.0 (6.0) units for groups 1–4, respectively (groups 1–2 vs group 4 p<0.01; group 1 vs group 3 p<0.001; other comparisons ns). There were no differences in radiological joint damage between groups 3 and 4. Annual SHS progression rates were the highest in year 1 (mean 3.4), with significantly more progression in groups 1 and 2 than in groups 3 and 4 (LMM p<0.05, figure 3E). 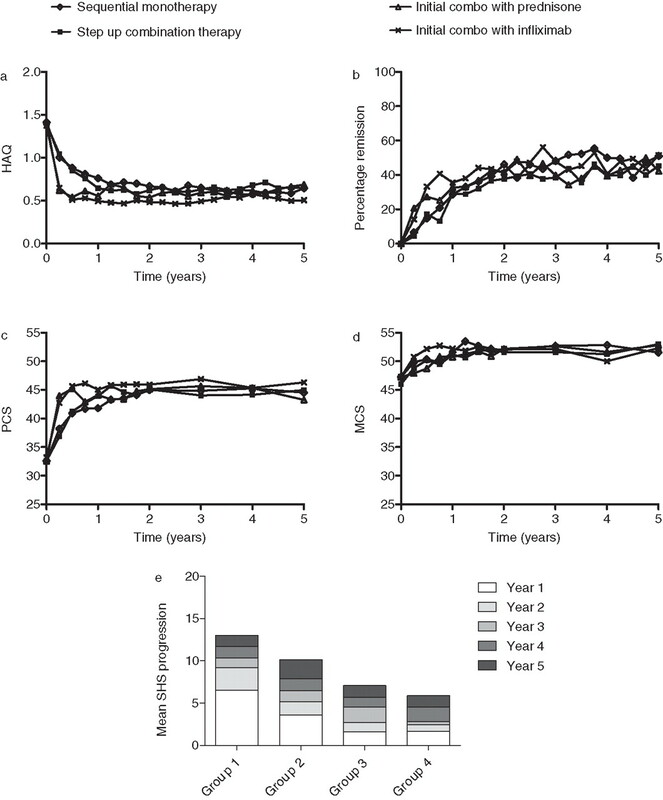 In the following years, progression scores continued to increase (mean annual progression 1.5, 1.1, 1.5, 1.6 in years 2–5; LMM p<0.02 for each year compared with the preceding year) without differences between the four groups. After 5 years, 48% of patients were in clinical remission defined as DAS less than 1.6 equally distributed among the groups (figure 3B). Of those, 46%, 51%, 65% and 81% of patients in groups 1–4 had achieved that on the initial therapy. Patients in remission after 5 years had significantly less joint damage progression (mean 7.6 vs 10.7, median 1.0 vs 2.5, p=0.001) and significantly better functional ability (mean HAQ 0.34 vs 0.79, p<0.001) than patients not in remission but with DAS of 2.4 or less. After 5 years, 14%, 16%, 10% and 19% of patients in groups 1–4 were in drug-free remission (overall p=0.18), with a median duration of 23 months (IQR 15–25 months) in all treatment arms. At achieving drug-free remission the mean HAQ was 0.16 (SD 0.30), comparable to HAQ values of the general population (mean HAQ 0.34).20 The median SHS progression after 5 years in these patients was 1.5 (IQR 0–7.8). Of the patients in sustained drug-free remission (definition ≥1 year, radiographs available in 41/48), 78% showed no joint damage progression (defined as >0 SHS units) in the first year of drug-free remission. During 5 years of follow-up, 437 (86%) patients experienced at least one adverse event. In total, 251 serious adverse events occurred in 152 (30%) patients, equally distributed among the treatment groups and over time (table 2; figure 4). The majority of the adverse events was mild to moderate and did not lead to treatment adjustments. Eleven of the 120 patients treated with initial combination with infliximab in group 4, and three of 52, none of 15 and three of 28 patients in groups 1–3 treated with delayed infliximab had an infliximab infusion reaction. During 5 years of treatment, the number of serious infections, malignancies and deaths (12 patients, table 2) were comparable across the groups. In group 4 one patient was treated for disseminated tuberculosis, despite 6 months previous treatment with isoniazide because of latent tuberculosis before the start of infliximab, according to the then current guidelines and the study protocol. She subsequently died of other infectious complications (year 2). Since then, the Dutch guidelines for the pretreatment of latent tuberculosis before start of tumour necrosis factor inhibitors have been intensified, as was the study protocol. No other tuberculosis occurred in the trial. Distribution of serious adverse events among the treatment steps and over time. Each dot represents one serious adverse event. The BeSt study shows that with dynamic treatment with currently available drugs, an impressive clinical and radiological gain can be made in the majority of patients presenting with severe RA, resulting in significant and sustained improvements in daily functioning and quality of life over time and adequate suppression of joint damage progression, irrespective of initial treatment. Contrary to expectations, by aiming at low disease activity, 48% of patients achieved early clinical remission, showing the least damage progression and the best functional ability of all. Up to 19% of patients even achieved drug-free remission, enjoying a functional ability that is similar to the general population, without having damage progression. Patients treated with initial combination therapy showed a more rapid improvement in disease activity, daily functioning and quality of life than patients treated with initial monotherapy, as shown earlier.10 The earlier clinical response in the first 6–9 months of treatment was reflected in significantly less joint damage progression in the initial combination therapy groups compared with the initial monotherapy groups in year 1. After 5 years of follow-up, the initial differences in joint damage progression are still present, although the annual progression rates in years 2–5 were comparable between the groups. Starting with combination therapy or reserving it for later did not affect toxicity. The initial combination arms showed an earlier clinical response than the initial monotherapy groups, but medication costs are substantially higher in the beginning of the study in the combination arms, especially in the initial combination arm with infliximab.21 This raises questions about the cost-effectiveness of the early start of biological agents.22 An early clinical response has been suggested to be relevant for the maintenance of paid work.23 24 In line with this, the cost–utility analysis of the BeSt study after 2 years showed that patients treated with initial combination therapy groups were able to keep paid work longer than initial monotherapy groups,21 which might (partly) compensate higher medication costs in groups 3 and 4. We are currently working on the 5-year cost–utility analysis that will elucidate which strategy is most cost-effective in the long term. The long-term follow-up of the COBRA and FIN–RACO trials suggested a difference in slope in the amount of joint damage after 1–2 years between the combination and the monotherapy arms, whereas we did not observe a difference in annual progression from year 1 until year 5 between initial monotherapy and initial combination therapy.25 26 Differences in study design and patient populations might have contributed to this discrepancy and harms direct comparison: continuous protocollary (BeSt) versus non-protocollary treatment after 1–2 years (COBRA, FIN–RACo), differences in frequencies of radiographs and scoring methods, different medication schemes and control groups (sulphasalazine in COBRA and FIN–RACo vs methotrexate in BeSt) and different targets (remission in FIN–RACo, DAS ≤2.4 in BeSt, no targeted treatment in COBRA). Reported remission percentages vary widely (10–65%) in various studies with recent-onset RA patients,27 as a result of differences in remission definitions, patient characteristics and study designs.28 Given the patients' disease severity and bad prognostic outlook at baseline, it is remarkable that after 5 years, 48% of patients were in clinical remission and 31% of those in drug-free remission. The study is underpowered to evaluate whether there are differences in (drug-free) remission rates between the four treatment groups. As the patients all satisfied the 1987 American College of Rheumatology classification criteria for RA, they already had well established disease. It is tempting to speculate on the impact of starting effective, dynamic, DAS-directed therapy even earlier in the disease course. Rather than comparing one static treatment with another, the BeSt study has integrated dynamic treatment into the trial protocol, to mimic daily practice. Taking it one step further, it has introduced protocolised tapering and discontinuation of medication into the trial design. We would like to encourage other research groups also to use a dynamic approach in future randomised clinical trials. In conclusion, with dynamic treatment with currently available drugs an impressive improvement in clinical and radiological outcomes of patients with recent-onset RA can be achieved, leading to 48% remission and up to 19% drug-free remission, irrespective of initial treatment. Starting with combination therapy resulted in earlier clinical improvement and less joint damage progression than starting with monotherapy, without more toxicity. With treatment adjustments aimed at low disease activity, in all four strategy groups the initial clinical improvement is maintained until 5 years of follow-up without deterioration. The authors would like to thank all patients as well as the following rheumatologists (other than the authors) who participated in the Foundation for Applied Rheumatology Research (all locations are in The Netherlands): W.M. de Beus, MD (Medical Center Haaglanden, The Hague); C. Bijkerk, MD (Reinier de Graaf Gasthuis, Delft); M.H.W. de Bois, MD, and G. Collée, MD (Medical Center Haaglanden, The Hague); J.A.P.M. Ewals, MD (Haga Hospital, The Hague); A.H. Gerards, MD (Vlietland Hospital, Schiedam); R.J. Goekoop, MD (Haga Hospital, The Hague); B.A.M. Grillet (ZorgSaam Hospital, Terneuzen); J.H.L.M. van Groenendael, MD (Franciscus Hospital, Roosendaal); J.M.W. Hazes, MD (Erasmus Medical Center, Rotterdam); H.M.J. Hulsmans, MD (Haga Hospital, The Hague); M.H. de Jager, MD (Albert Schweitzer Hospital, Dordrecht); J.M. de Jonge-Bok, MD (Groene Hart Hospital, Gouda); M.V. van Krugten, MD (Admiraal de Ruyter Hospital, Vlissingen); H. van der Leeden, MD (retired), W.F. Lems, MD (Slotervaart Hospital, Amsterdam); M.F. van Lieshout-Zuidema, MD (Spaarne Hospital, Hoofddorp); A. Linssen, MD (retired), P.A.H.M. van der Lubbe, MD (Vlietland Hospital, Schiedam); C. Mallée, MD (Kennemer Gasthuis, Haarlem); T.H.E. Molenaar, MD (Groene Hart Hospital, Gouda); M. van Oosterhout, MD (Groene Hart Hospital, Gouda); H.C. van Paassen, MD (Sint Franciscus Gasthuis, Rotterdam); A.J. Peeters, MD (Reinier de Graaf Gasthuis, Delft); H.K. Markusse, MD (deceased), D. van Schaardenburg, MD (VU Medical Center, Amsterdam and Jan van Breemen Institute, Amsterdam); A.A. Schouffour, MD (Groene Hart Hospital, Gouda); R.M. van Soesbergen, MD (retired), P.B.J. de Sonnaville, MD (Admiraal de Ruyter Hospital, Goes); I. Speyer, MD (Bronovo Hospital, The Hague); K.S.S. Steen, MD (Kennemer Gasthuis, Haarlem); G.M. Steup-Beekman, M.D. (Bronovo Hospital, The Hague); J.Ph. Terwiel, MD (Spaarne Hospital, Hoofddorp); A.E. Voskuyl, MD (VU Medical Center, Amsterdam); M.L. Westedt, MD (Bronovo Hospital, The Hague); S. ten Wolde, MD (Kennemer Gasthuis, Haarlem); J.M.G.W. Wouters, MD (Sint Franciscus Gasthuis, Rotterdam); D. van Zeben, MD (Sint Franciscus Gasthuis, Rotterdam). The authors would also like to thank all other rheumatologists and trainee rheumatologists who enrolled patients in this study, and all research nurses for their contributions.
. Comparison of combination therapy with single-drug therapy in early rheumatoid arthritis: a randomised trial. FIN–RACo trial group. Lancet 1999;353:1568–73.
. Drug-free remission, functioning and radiographic damage after 4 years of response-driven treatment in patients with recent-onset rheumatoid arthritis. Ann Rheum Dis 2009;68:914–21.
. Translation, validation, and norming of the Dutch language version of the SF-36 Health Survey in community and chronic disease populations. J Clin Epidemiol 1998;51:1055–68.
. Cost-utility analysis of treatment strategies in patients with recent-onset rheumatoid arthritis. Arthritis Rheum 2009;61:291–9.
. Cost-effectiveness of biologics in early rheumatoid arthritis. Ann Intern Med 2010;152:333–4.
. Early suppression of disease activity is essential for maintenance of work capacity in patients with recent-onset rheumatoid arthritis: five-year experience from the FIN–RACo trial. Arthritis Rheum 2005;52:36–41.
. Predictors of remission, normalized physical function, and changes in the working situation during follow-up of patients with early rheumatoid arthritis: an observational study. Scand J Rheumatol 2009;38:166–72.
. Survival, comorbidities and joint damage 11 years after the COBRA combination therapy trial in early rheumatoid arthritis. Ann Rheum Dis 2010;69:807–12.
. Early combination disease-modifying antirheumatic drug therapy and tight disease control improve long-term radiologic outcome in patients with early rheumatoid arthritis: the 11-year results of the Finnish Rheumatoid Arthritis Combination Therapy trial. Arthritis Res Ther 2010;12:R122.
. Innovative treatment strategies for patients with rheumatoid arthritis. Curr Opin Rheumatol 2008;20:287–94.
. Defining remission in rheumatoid arthritis: results of an initial American College of Rheumatology/European League Against Rheumatism consensus conference. Arthritis Rheum 2009;61:704–10. Funding The trial was sponsored with a government grant from the Dutch College of Health Insurance Companies with additional sponsoring by Centocor Inc. and Schering-Plough Ltd. The sponsors were not involved in the study design, data collection, data analysis or preparation of the manuscript. Ethics approval Ethics approval was obtained at the medical ethical committees of all participating centres.